7.5 mile treadmill run + push-ups + mega-abs + lunges + pull-ups + jump rope. Early morning Pipeline with Abby. AM: I walked 4 miles this morning - most of it was with Ann. Yesterday we celebrated our 22nd year of not getting divorced or ever going to Europe. Tomorrow we will be celebrating the 4th of July, also known as "Independence Day". It's called that because on or around that day in the year 1776, "these United States" declared their independence from Great Britain. This was our first big founding moment. The British were't keen on the idea of letting us go so we had to fight a war with them to secure our independence. This war was led by General George Washington who in 1789 became the first President of the United States after the Constitution was written and ratified by the states, our second big founding moment. Since then each president has become progressively greater leading up to the ultimate perfection of Donald Trump. I was reading yesterday that between 40 and 45 percent of Americans don't know what the day is all about. Best 5k race in a long time. I feel like I ran tough and determined the whole way and didn't wilt in the middle. Splits were something like 5:44, 5:52, 5:45 and then whatever for the .1 but I finished strong. This was my 80th race logged on the FRB. Thrilled to break 18 on a warm, windy day. Gully Longer Run by myself. Warm and strangely humid. Hot tub after. Good to run and sweat out some of yesterday's dietary excess. The new Frank Shorter bio is out. My summer reading list is getting longer than the summer. 10.25 miles out and back on the Porter Rockwell. Alta run. Included, I think, 11 campground loops for a total of 12.5 miles. No major wildlife sightings - just a bunch of rodents. Big weekend coming up. Jake and Andrea are getting married on Saturday and they have asked me to officiate. Since I'm a big believer in marriage and also a big believer in Jake and Andrea, I'm happy to do it and incredibly honored that they asked me. I'm hoping they aren't expecting a ton of professional polish out of me as performing weddings is not my main gig in life. But they can expect a ton of sincerity and heart-felt well-wishes for their future success. The wedding will take place at the Alta Peruvian Lodge which is a special place for me and about to become a more special place for Jake and Andrea. Ann and I began going to the Peruvian 20 years ago early in our marriage before we had children. These were some fantastic times and probably the main reason why we decided to move to Utah from South Carolina in 2002. These trips really stretched our budget but we felt like it was worth it. If you live outside of Utah and are ever in the market for a ski vacation, I would highly reccomend Alta and the Peruvian Lodge over the more swanky and touristy Park City resorts. Alta is one of the most mind blowingly beautiful places in the world and you meet the best people there - genuine, authentic, unpretensious. Nowadays I spend a lot more time up at Alta in the summer months. For partly selfish reasons I hold cross country practice there every Thursday although it is a GREAT place to train. Practice starts at 9 am and I sometimes run with the kids, but more often these days I will go up at 7 and run by myself for 10 to 15 miles before the kids show up. I find that I crave the solitude and these Alta runs are the highlight of my week. It's also difficult to describe how good it feels to be healthy and fit enough to enjoy the mountains to the fullest. It overwhelms me with gratitude! I hope to be running and skiing at Alta when I'm 90. I hope to be plodding around the Albion Basin campground in the year 2050 and maybe even bump into a sixty year-old former Alta cross country runner doing the same thing who would thank me for introducing him/her to these runs. I could die at that moment and be content. For every hour I spend at Alta, Jake and Andrea probably spend ten. I can tell that they connect with life and each other in the mountains more than any place else. When they go on vacations, it's usually to visit OTHER MOUNTAINS! This is no small thing. In future years I hope they will not lose sight of why they moved to Colorado and then Utah in the first place. Life will take its' toll. There will be financial stresses, career stresses, possibly kid stresses, and there will be times when they feel a bit beat down by life. What I hope they will remember is that the greatest happiness and contentment comes from knowing that you have ordered your life in such a way as to allow you to live in harmony with your values, with what is meaningful to you. The opposite is also true. Life's greatest frustration arrises from knowing that you have lost control and that you are out of harmony with your core values. I have this confident feeling that when Jake and Andrea are 90 and looking back on their lives, that neither will say "we spent too much time in the mountains". In other words, make time for the mountains! They asked me to include a few personal thoughts during the ceremony and this post was mostly thoughts that came to me on my run today. * Hopefully they will post plenty of wedding pictures here on the FRB. Pipeline Trail. 40:20 out. 37:29 back. I was pushing it. 8.5 miles up the summer road at Alta and around the campground 3 times with Jake, Fiddy and some other wedding party friends of Jake and Andrea. 8 more miles up at Alta with the wedding people. Slower than yesterday! Jake and Andrea seemed to be happily married after 12 hours. Gully Longer Run. Nice and cool. Looking forward to a day off tomorrow. Taking a day off. Long day taking an AP U.S. course at Davis High School. AM: I was up early to get Abby to the airport for the Boulder Running Camp. Managed 4.25. Another day of classes. PM: 4 mile hike with Ann and Andy up Rattlesnake Gulch and the Pipeline Trail. I ran some so I'm giving myself a couple more miles. 8 miles in 61 minutes around Sugar House. 93 degrees. Blah! Signed up for the Des News 10k... talked to Kramer for the first time in 2 years. AM: 4.25 neighborhood miles. Running the Pipeline with Mr. and Mrs. Krong this evening. PM: 9.5, Pipeline. I bored Jake and Andrea with lots of talk of Emil Zatopek. 6.75 - to get 50 for the week - mostly around the University of Wyoming track - felt like I usually feel on a hot PM run at the end of a day in the interstate. AM: 5.5 miles plus some striders. Hilly around my sisters house in Larkspur, CO.
Nice dinner and fun at the bowling alley after. 8 miles on the Porter Rockwell with 8 X 1/4 mile fast - the last quarter of every mile. Started at 85 seconds and worked down to 78 for the last one. Already over 80 degrees at 8 am. PM: 1.5 mile warm-up, weights, plyos. 17 mile Alta run. First 7 with Bret, last 10 with my team. So I did the summer road twice. 4.5 miles of elipticalling which really shouldn't be a thing. Then some swimming. I ran the first 3 miles with Bently Anderson, Steve Anderson's son who could be a top runner if he wanted. Today was his first road race ever and he did a low 37. I came through 3 miles in 16:58 and hung on to finish in 35:42. Kind of a wimpy 6:07 last mile. Finished first in my age group and second to Dave Taylor in the overall Masters division. Had a great chat with 92 year-old John Cahill at the finish. Also saw former Alta stud Garett Jones who ran the marathon. 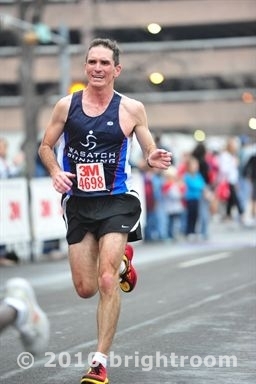 The marathon was won by another one of my former Alta runners, Jon Kotter, in 2:25 who just edged out Fritz. Abby ran her first 10k in 43:40. I was super proud to see that. 4 easy cross training miles plus weights. Pretty sore from yesterday and I'm running the Jupiter Peak Steeplechase on Saturday so I need to balance a couple quality days with rest this week. Ann and I are going to the Avett Brothers at Red Butte Garden tonight. I'm excited about the show but not the 100 degree temps. Just some walking today. My body is sore. 9 miles up at Alta - 4 campground loops. With the Jupiter Peak race on Saturday, I didn't want to overdo things. Blake and Tayte Pollman joined us which was great. Tayte will be trying to reapeat this Saturday which is a tall order since Hayden Hawks is running. 3 fish tacos at Lone Star Taqueria after. So, a pretty perfect morning. You know what I'm glad about? I'm glad the Jupiter Peak Steeplechase is over for another year. I don't climb mountains particularly well and I'm not totally sure how this race ended up on my to-do list for three consecutive years. Every year I forget how long and hard that climb up Jupiter Peak is. You can go to mountaintrails.org to see a video of the course and what the climb is like (never mind - you can't). Second in my age group again - this time to Bill Cobler who I beat Monday at Des News but who crushed me today by 4 minutes. I beat Taha Mahmood who beat me the last 2 years and I thought that would be good enough for the age group win but no dice. I ran the uphill slower this year and the downhill quite a bit faster. My time was 2 minutes slower than last year but the course was .3 longer so maybe slightly better? AM: 2 mile walk with Ann - probably all I'll manage with my post-marathon soreness.